First First Parish Church, Unitarian-Universalist, Fitchburg, MA, was built in 1837, and is the home of a congregation gathered in 1768. Robin Dinda has been Music Director at First Parish since February, 2000. The E. M. Skinner organ of First Parish was built in 1928, and is tonally intact - although a new console was built in 1996 and a set of 4´ flute pipes was added in 2006, not one original pipe has been altered. The Skinner company was held in the highest esteem among American organ builders in the 1920s, then and now. This organ was constructed just after the legendary G. Donald Harrison joined the Skinner firm. Although still emphatically an orchestral style organ, some of the newer thoughts about ensemble sound can be detected, especially in the diapason chorus on the Swell. The organ is voiced heroically, especially the diapasons. The reeds are dark but colorful, the flutes are pretty, and the strings are lovely. An advantage to presiding over an organ that is just large enough for three manuals is that I get to explore every stop in detail. A good introduction to this historic instrument is a video of Robin Dinda playing a version of Fats Waller's Ain't Misbehavin, linked here. Most of the attractive solo and ensemble sounds of the organ can be heard in only two minutes. Pictured here are the façade pipes. In typical 1920s style, about 1/3 are dummies. Small pipes of the Great division are visible at the bottom. The Choir division, small and quiet but very useful. 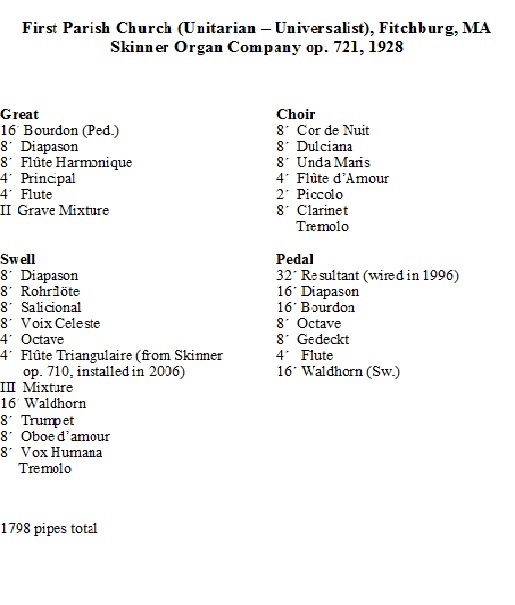 The labels identifying the ranks of pipes are to facilitate the occasional organ tour. The Choir is behind the pipes of the Great. The Great division, behind the façade pipes. Wooden pedal pipes (diapason and bourdon) are visible in the rear. The Swell division is the largest and most developed division of the organ. It sits above the Choir. This view is as the pipes appear as one enters the division. The pipes of the Swell, now facing the entrance. The wooden pipes on the right, on their own chest, are the one addition made to the organ. They are a 4´ flute from another 1928 Skinner, so their sound fits the organ perfectly. Here is the stoplist. The next opus number, 722, was Woolsey Hall, Yale University, so we like to say that this organ is its prototype!